Snowblower Forum : Snow Blower Forums > Snowblower Forums Main > General Snowblower Discussion > Snow Stories - Winter 2018/2019. Snow Stories - Winter 2018/2019. Winter begins in November for many of us. Its already been snowing in several areas of the US and Canada..
Time to start up our annual thread for talking about snow and storms..
Well, the weather man says it was snowing hard on top of Mt Washington last week with 6' drifts! Nothing but balmy 65F temps this morning and tons of humidity here. Machines are prepped (two weeks ago) and ready to roll! El Nino might keep posts in this thread low..
Then on the other side we have another weather prediction which calls for a big El Nino winter. Last time we had such a winter was 20 years ago. In January 1998, we lost electrical power for 30 days due to amazing ice storms. I'm thinking about buying a generator, just in case. I remember 20 years ago, during and after the storm, generators were marked up like crazy. So far here we have just seen a trace of snow a few days ago. All my vehicles are either stored or ready for winter. Snowblower is ready, gas can is full, bring it on. Back on Oct 14 thought it was a precursor to what was to come and it could come early. We'd been out of state on our Fall Color Run with the Corvette Club. When it was time to head home, it started snowing. Along the way we drove through snow for some distance and in spots there was about 2" of snow on some of the farms rooftops. It made for a thrilling drive along the way. Luckily it didn't happen as it could have but got me thinking about getting the blower out and start prepping it for this winter. This year I'm not planning on going to work every day like in the past, this year I can do work from home as I see fit. If the roads are bad, I'm staying home and work from the house. I have a gut feeling it could be bad but then again I've been wrong before. Prepped the Vette and T-Bird for winter storage but not truly stored yet. I plan to drive them a little more while the weather permits. I recently bought this generator from Sam's Club. It gets good reviews everywhere, and I wanted something big enough to power the whole house (with judicious electrical use) but still be portable. Sam's Club had the best price and has a very easy return policy if I wind up not liking it, so I bought it from them. Here it is during its first load test. So far, I'm happy. I haven't had to use the generator in an outage yet, but it's passed all its load tests with flying colors. It will basically power anything in the house, just not all at the same time. I couldn't use all four burners on the electric range while drying a load of laundry in the electric washer, for example; but with minimal rationing, it should allow for relatively normal life during outages. I installed it up-to-code using an interlock in the breaker panel as documented in this blog post. More pictures of the shed I put it in can be found on this post. I was going to add ventilation to the shed to allow the generator to run inside of it, but I decided not to because the required venting would increase the likelihood of mice getting inside. I'll try it with the generator inside the shed and the doors and lid open just to see how it works; but if I have to pull it out a few feet onto the lawn to use it, that's okay, too. I did make a hole in the back of the shed for the inlet box, however. Because the heavy cord doesn't bend very much, it was either that or move the shed a foot from the wall or to either side of the inlet box, either of which would slightly complicate snow removal. The way it is now, one pass with the snowblower right past the doors of the shed should make it accessible in the winter, and I think the roof soffit overhang will prevent snow from building up between the shed and the house. The shed was leveled with rocks, which are always in abundant supply in Delaware County. They're our most reliable crop. 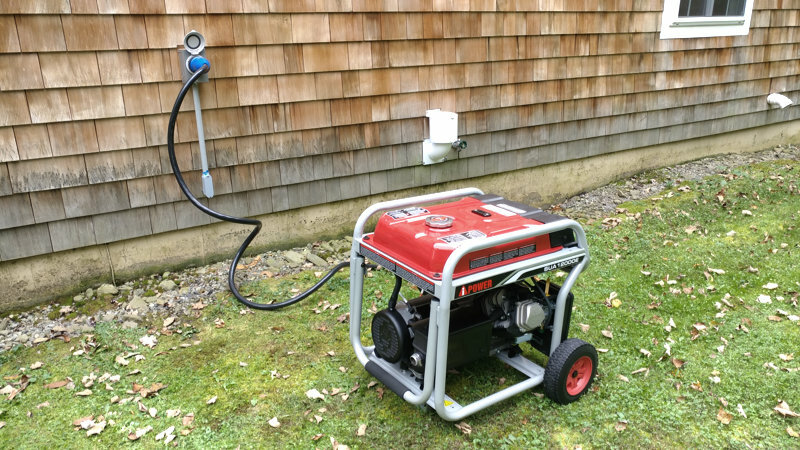 There is a third-party mod available for the generator that allows it to use propane or natural gas in addition to gasoline. But either of those fuels will reduce the generator's output and possibly void the warranty, so I decided not to do the mod for now. Maybe when the warranty expires I'll rethink that option and pipe it into the propane system. Do not leave the generator in the shed if you need it as the fumes will not dissipate and the carbon monoxide will remain in a very heavy concentration for a long period after you run out of fuel. The dual fuel carburators (gasoline/propain)have been around along time and gas engines can be converted with a little work. It would be better and safer for you and your family to purchase a longer 220 volt clothes dryer cable to keep the generator further away from the home as your furnace/boiler will always be pulling in outside air for combustion. You can purchase catalytic converters for your size gas engine. We have a long thread discussing them on the forum. I bought the catalytic converter for my firewood processor from Foley Engine Service as the GX340 honda engine made me sick every time I split firewood. With your system you will need to purchase the correct catalytic converter muffler for your engine and exhaust pipe extension as you have the fuel tank mounted on top rather than using a side mounted fuel tank if you decide to pursue this option as the exhaust will only be carbon dioxide and water vapor in the exhaust emmissions. I bought my generator last weekend, a 7500W continuous, 9300W surge, gas only unit made by Champion that was on sale at a local store (couple hundred $ off). 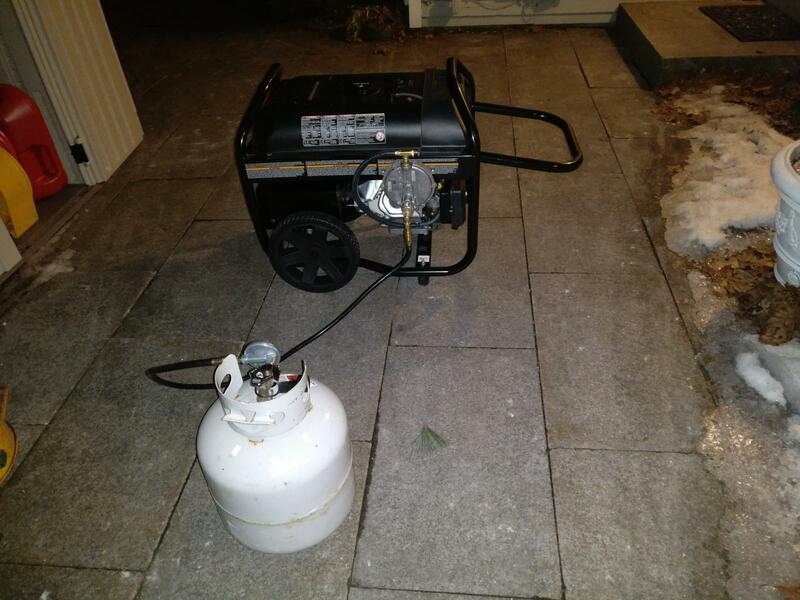 I do not have anything else that uses propane, so I didn't buy a dual energy unit. In my case, when needed the generator will be run outside the garage which is about 130' away from the house. The cable and breakers from the house to the garage can handle 100A while the generator can only produce a tad over 30A. With selective electrical use, we'll be able to live through a long blackout no problem. Our main heating source is a wood furnace, so we won't "waste" any power on electrical heating. All that's left for me to do it install the connector outside the garage and link it to the garage's panel. On a snowblower related story, while checking Champion Power Equipment's website I saw they now sell a snow blower. They only have one model and size at the moment. You need to realize that this is an illegal back-feed connection. Generator connections must be made to the main distribution panel where the generator inlet breaker is adjacent to the main breaker and an interlock device prevents both the main and generator breakers being engaged simultaneously. 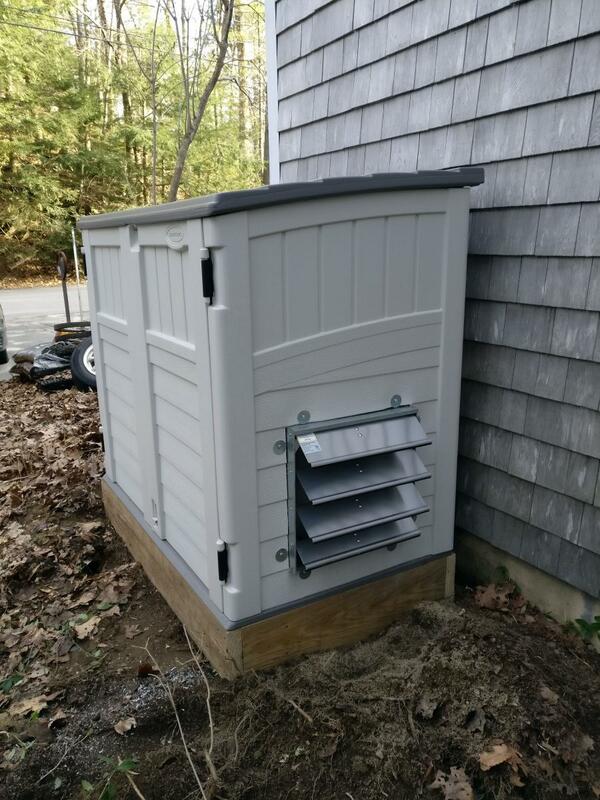 I was going to add ventilation to the shed to allow the generator to run inside of it, but I decided not to because the required venting would increase the likelihood of mice getting inside. 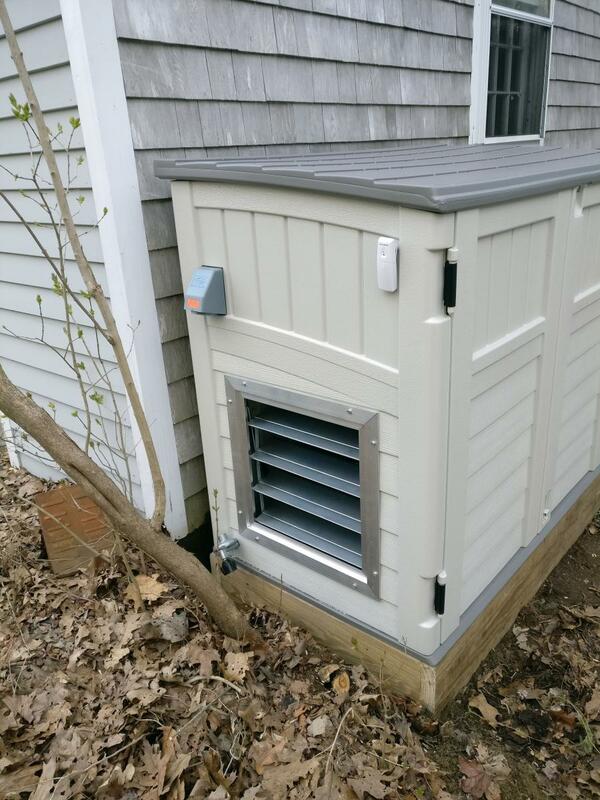 I was worried about that, too, so I used a single 16" fan plus automatic shutters on both sides of my generator shed to keep air flowing briskly, and they close automatically and securely when the generator is not in use. I also have a wireless thermal alarm set up to alert me if the shed temperature exceeds 80F. There is a third-party mod available for the generator that allows it to use propane or natural gas in addition to gasoline. I also added a propane snorkel to the generator, which took only about 15 minutes and is completely reversible, except for the 2 small mounting holes on the side panel. It works great, and gives me another fuel option during long outages. I always have 4 or 5 20-40lb cylinders around for the grill, barn heater and my fork lift. Last edited by tabora; 11-07-2018 at 07:02 PM.